Global warming isn’t the cause of slowdown in a huge circulation pattern in the Atlantic Ocean, which is, in fact, part of regular, decades-long cycle that will affect temperatures in coming decades, according to a new study. Oceanographers are concerned about the long-term stability of the Atlantic Ocean circulation, and previous studies show that it has slowed dramatically in the past decade. “Climate scientists have expected the Atlantic overturning circulation to decline long-term under global warming, but we only have direct measurements of its strength since April 2004. And the decline measured since then is 10 times larger than expected,” says corresponding author Ka-Kit Tung, a professor of applied mathematics at the University of Washington with an adjunct appointment in atmospheric sciences. 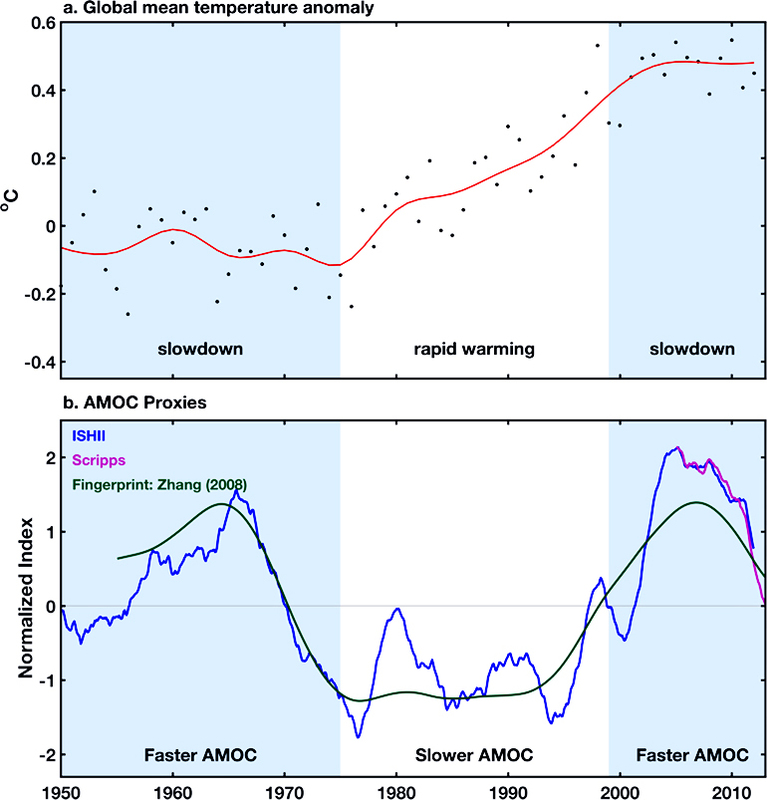 “The global climate models can project what’s going to happen long-term if carbon dioxide increases by a certain amount, but they currently lack the capability to predict surface warming in the next few decades, which requires a knowledge of how much the excess heat trapped by greenhouse gases is being absorbed by the oceans,” Tung says. 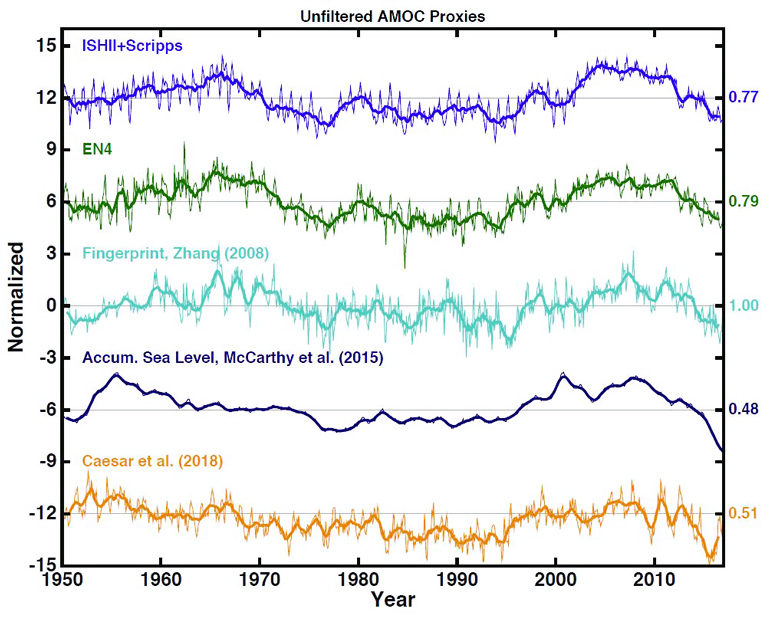 From 1975 to 1998, the AMOC was in a slow phase. As greenhouse gases were accumulating in the atmosphere, Earth experienced distinct warming at the surface. From about 2000 until now, the AMOC has been in its faster phase, and the increased heat plunging in the North Atlantic has been removing excess heat from the Earth’s surface and storing it deep in the ocean. “We have about one cycle of observations at depth, so we do not know if it’s periodic, but based on the surface phenomena we think it’s very likely that it’s periodic,” Tung says. The new paper supports the authors’ previous research showing that since 2000, during which observations show a slowdown in surface warming, heat has accumulated deep in the Atlantic Ocean. The new study shows this is the same period when Atlantic overturning circulation was in its fast phase. Recent measurements of density in the Labrador Sea suggest the cycle is beginning to shift, Tung says. That means that in coming years the AMOC will no longer be sending more of the excess heat trapped by greenhouse gases deep into the North Atlantic. The paper appears in Nature. Additional authors are from the Ocean University of China and Qingdao National Laboratory of Marine Science and Technology. The US National Science Foundation, the Natural Science Foundation of China, the National Key Basic Research Program of China, and a Frederic and Julia Wan Endowed Professorship funded the study.